Al Bello/Getty ImagesThe New York Jets will hopefully get their quarterback of the future with the third overall pick in the NFL Draft. 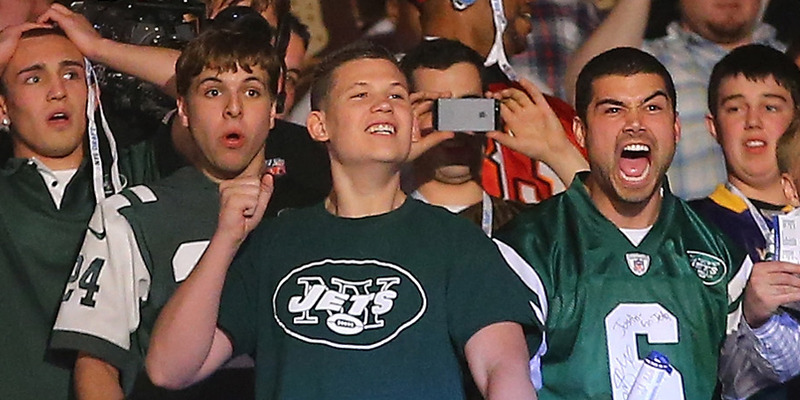 The New York Jets pulled off a monster trade with the Indianapolis Colts, giving up their No. 6, No. 37, and No. 49 picks, as well as their 2019 second-round pick for the third overall pick in the 2018 NFL Draft. The move suggests that the Jets believe their quarterback of the future will still be on the board with the third pick, and don’t want to miss their shot at picking him up. Experts are split on whether or not the move was a smart one for the Jets. The New York Jets are moving up to the third overall pick in the 2018 NFL Draft, suggesting they are hoping to snag its preferred quarterback of the future. The move came at a fairly steep price, with the Jets sending their No. 6, No. 37, and No. 49 pick to the Colts, as well as their 2019 second-round pick, in order to move up three spots at the top of the draft. The extra picks will go a long way towards helping Indianapolis build an offensive line that can protect quarterback Andrew Luck. The Jets had initially hoped to sign Kirk Cousins in free agency to solve their quarterback woes, but after Cousins chose to take his talent to Minneapolis, New York re-signed veteran Josh McCown and brought in Teddy Bridgewater to add depth at quarterback. Now, they will have the third pick in a draft loaded with quarterback talent and enough veteran talent to let the rookie develop at his own pace. Experts and analysts seemed split on whether or not the move was a smart one for the Jets. For some, the cost of moving up was a drastic over-payment, but others noted that if you do wind up drafting your next franchise quarterback, then the trade is not only justifiable, but an incredible value. NFL Hall of Famer Jimmy Johnson developed a draft pick value chart in the 1980s in an attempt to compare the value of picks relative to each other in the NFL Draft. By his metric – which overvalues picks at the top of the draft – the Colts came out on top of the trade, but it was still a reasonable transaction between both parties given that the Jets were the ones that wanted to move up. That said, if you go by other metrics – such as FootballPerspective.com’s draft pick value chart – the Colts end up much further out on top, with their return almost doubling the value of the No. 3 pick they traded away. Experts and sports fans took to Twitter to express their delight, embarrassment, and cautious optimism regarding the trade. That is an absolutely brutal trade for the Jets. Embarrassing even for them. 1 Colts did great, getting 3 2’s to drop 3 spots with QB wasn’t a need for them. 2 If Jets get QB of future (won’t know till 2019), it’s not too much. 3. Bills cannot be happy. The trade is also having ramifications for teams across the league looking to set themselves up for draft success, as the move up the draft board indicates that the Jets are looking to take a quarterback at the top, leaving teams like the Bills to scramble as they might be forced to go with their second option. We’ll have no way of knowing whether or not this trade worked out for the Jets for at least a couple of years – if they wind up finding their next franchise quarterback, it will go down as one of the smartest moves of the 2018 offseason. But on paper, it still looks like the Colts cashed out pretty well.